Elevated Toilet Seat with Arms and Legs fits over toilets up to 16" high. Adds 4" to seat height. 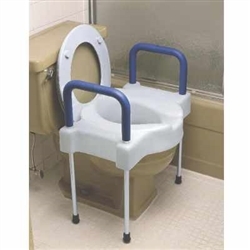 Soft armrests assist user when sitting down or rising from the seat. Seat size: 22.5" Wide x 15.25" Deep.